of Year 11 came third in the Hull and East Riding round of the Royal Society of Chemistry’s practical and quiz competition “Top of the Bench”. In a gruelling six and a half hour competition spread over two evenings at the University of Hull, the students completed an individual written test, a series of ten table-top team challenges and a practical which involved designing a timer using an oscillating chemical reaction. 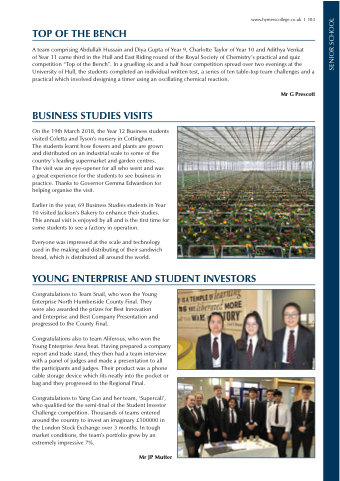 On the 19th March 2018, the Year 12 Business students visited Coletta and Tyson’s nursery in Cottingham. The students learnt how flowers and plants are grown and distributed on an industrial scale to some of the country’s leading supermarket and garden centres. The visit was an eye-opener for all who went and was a great experience for the students to see business in practice. Thanks to Governor Gemma Edwardson for helping organise the visit. Earlier in the year, 69 Business Studies students in Year 10 visited Jackson’s Bakery to enhance their studies. This annual visit is enjoyed by all and is the first time for some students to see a factory in operation. Everyone was impressed at the scale and technology used in the making and distributing of their sandwich bread, which is distributed all around the world. Congratulations to Team Snail, who won the Young Enterprise North Humberside County Final. They were also awarded the prizes for Best Innovation and Enterprise and Best Company Presentation and progressed to the County Final. Congratulations also to team Aliferous, who won the Young Enterprise Area heat. Having prepared a company report and trade stand, they then had a team interview with a panel of judges and made a presentation to all the participants and judges. Their product was a phone cable storage device which fits neatly into the pocket or bag and they progressed to the Regional Final. Congratulations to Yang Cao and her team, ‘Supercali’, who qualified for the semi-final of the Student Investor Challenge competition. Thousands of teams entered around the country to invest an imaginary £100000 in the London Stock Exchange over 3 months. In tough market conditions, the team’s portfolio grew by an extremely impressive 7%.